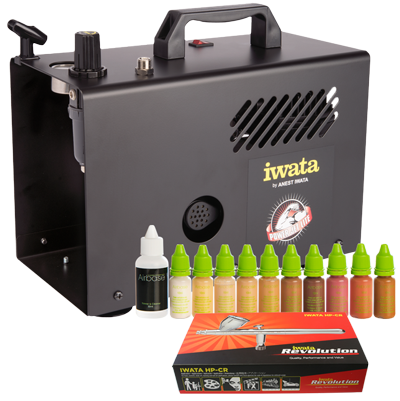 The Iwata Power Jet Lite compressor is powerful and can run two fine airbrushes or one high-flow airbrush or a small spray gun. 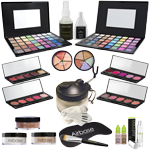 It features an automatic switch, automatically turning the compressor on when you press your airbrush trigger, providing instant air at the pressure you have set it, and turns the compressor off again when the airbrush is not in use. It has a duty cycle of 60 minutes continuous use. 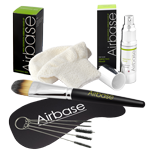 Please click here to view our Airbase Airbrush Kits. 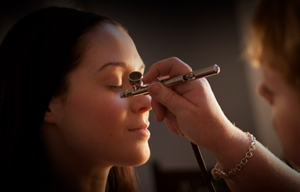 The Power Jet Lite incorporates a pressure regulator which is extremely useful when airbrushing make-up as it allows you to reduce the pressure when working on the face, particularly around the eyes. For further convenience of control you may add an end-of-line Sparmax bleed valve, an end-of-line moisture filter with bleed valve or a quick release body with air valve with a quick-release plug. And you may upgrade the foundation pack to 30ml bottles (with 100ml Thinner & Cleaner). Please select from the options at the top of this page.